Java or UML or both ? EclipseUML architecture is composed of a live MOF to UML synchronization. Traditional UML Eclipse tools require 4 different stages which add unnecessary complexity. 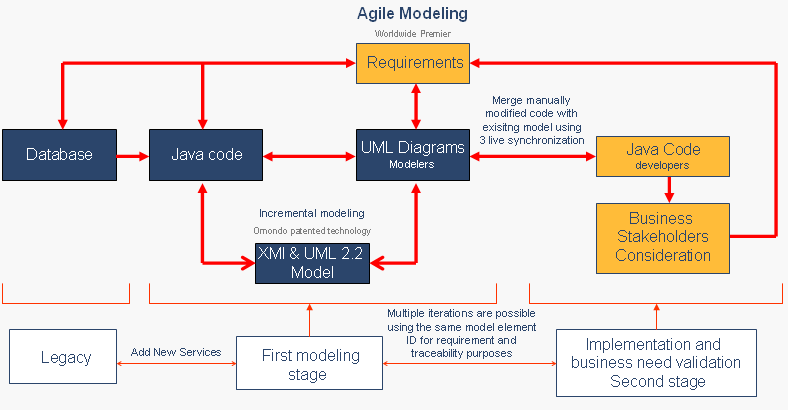 A sophisticated UML project developed with EclipseUML requires only a few hours before being able to produce advanced Java code, whereas over 3 months would be needed to produce beginner level java code using Eclipse modeling set of open source plugins. The new revolutionary Omondo architecture is built on the top of MOF and uses Ecore as opposed to traditional tools which use transformation layers. One of the main issues today for corporate project development is to decide which waterfall or agile methodology to use and how to leverage on the extraordinary EMF power. Users can select either waterfall 100% free EMF modeling frameworks or immediatedly start with EclipseUML 2013 which is built on the top of Ecore. EclipseUML agile patented technology only uses open source standards and agile project iteration . Our company was founded by Java developers for Java developers keen to spend more time on understanding and analyzing business needs as well as on coding. In the last 6 years Omondo has been providing UML tools for Java Developers. Thousands of projects have used EclipseUML successfully. Omondo's new challenge is to give Architects the control of the model to enable them to add business logic using the full project model and not just pieces of the model with basic EMF export for each diagram. Our tight Eclipse integration and robust software application already being used by over 350 000 users, will secure the adoption of the model approach among Project Managers, Lead Technologists and Developers. This model-driven approach allows them to rapidly and efficiently create, deploy and maintain higher quality applications at a lower cost, respecting business needs.